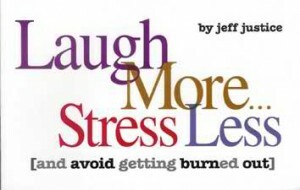 This book is a collection of Jeff’s funniest stories and targeted insights on living your life with humor. You’ll laugh as you learn how to use your sense of humor to release stress, defuse anger and avoid getting burned out at work and home. Jeff is a top corporate humorist and the nations most successful teacher of stand-up comedy with over 1300 graduates. There’s a laugh on just about every page and even a section on what stresses out different type personalities. You’re sure to recognize yourself in the examples and knowing what causes you stress is the first step in managing it. You’ll also enjoy the funny cartoons sprinkled throughout the book by syndicated cartoonist, Randy Glasbergen.